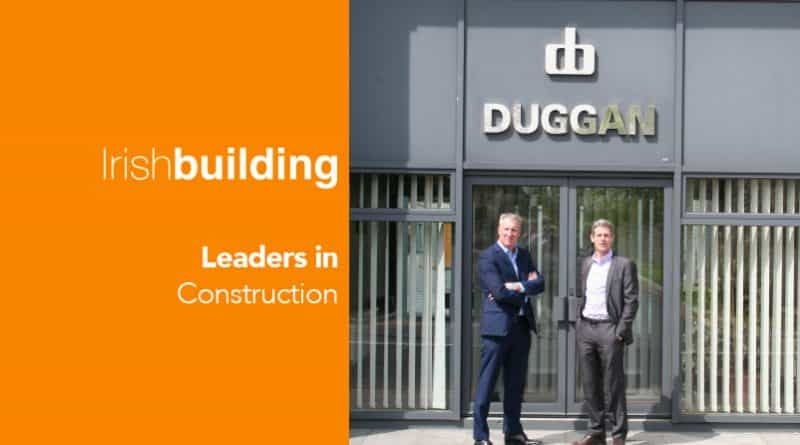 Joint Managing Directors Seamus Duggan and David Duggan discuss key projects from the past year, future growth, challenges in construction, Ireland 2040, and the importance of supporting diversity in the workplace. Established in1926, Duggan Brothers is now in its third generation. They currently employ 85 people working out of their Head Office in Templemore, their Dublin and Cork regional offices and numerous construction sites. Following a turnover of circa €53m in 2016, their turnover level dropped back slightly to €50m in 2017 as a number of projects were delayed in commencing. Their anticipated turnover level for 2018 is forecast to be between €65m to €70m. Duggan Brothers are seeing an increase in tender opportunities this year compared to last. Duggan Brothers’ highlights from 2017 include the completion of the Slane Whiskey Distillery, which involved a €15m CSA package on a state of the art distillery and visitor centre build within and around the old disused courtyard buildings adjacent to the historic Slane Castle. Another highlight in 2017 was the completion of the €22m Wexford Garda Head Quarters building, a very challenging and diverse project completed on time and within budget to a very high standard of architectural finish. There were significant logistical, structural, architectural, environmental and resource management techniques required throughout the project which caused staying within the parameters of the project schedule challenging. These challenges were all managed by use of a collaborative approach between the design and construction teams that planned, understood and resourced the works efficiently. The implementation of this approach throughout the project reaped positive results for all of the team involved. Duggan Brothers current projects include a €20m 100-bed healthcare facility for Peamount Hospital, a significant conservation/restoration project at Leinster House for the OPW, a €10m extension to the Lochlann Quinn School of Business in Belfield for UCD, a number of residential projects and a new office for the Irish Stock Exchange off Foster Place in Dublin City Centre, amongst others. “We are very pleased to be working on these prestigious projects which allow us to showcase our ability and further strengthen our reputation within the industry,” they inform us. Construction Safety Week in October 2017 was a great success for the industry and Duggan Brothers. Activities included daily Toolbox Talks and presentations on the topic of the day, specialist suppliers’ presentations, safety video presentations in the site canteens, enhanced focus on their Safety Observation Reports incentive scheme and daily director safety audit inspections. From their experiences, they say the Public Works Contract has caused significant damage since it was introduced in 2007. Giving their assessment of it, they say: “It is weighted heavily against the Contractor and consequently promotes an unnecessarily adversarial approach to contract administration. Under the old GDLA contract, we generally had real cooperation between the parties now cooperation is a contractual obligation.” Due to its structure and condition precedent requirements, the PWC necessitates a different approach compared to private projects, particularly in terms of paperwork and administration, however as a company Duggan Brothers try to minimise the impact of this by taking a reasoned approach to its strict implementation. They find that this approach is welcomed by Contracting Authorities and Design Teams and has served them and ultimately their projects well. They believe visiting primary schools will encourage young female students earlier on in their school lives to think about construction disciplines as a career path, as often it is too late at second level to begin influencing these decisions. As the economy continues to grow Duggan Brothers expect to continue to grow their turnover and market share. They say they still have the capacity within their management levels and structures and are seeking to get to a level where they are operating at maximum efficiency for their scale. Adding that this growth needs to be achieved on a sustainable basis where tender opportunities and market levels are viable.